This one is one of the most celebrated business quotes ever by American industrialist Henry ford( 1863 – 1947), the founder of the ford motor company. If a business is not for making money, then what does it means for. Not everyone knows what for . Henry ford was the kind person who worked with the great inspirational scientist like Thomas Alva Edison in Edison Illuminating Company. We live in a world where competitions are very high. So people forget about the ethics and morals of business and daily life. By saying " A business that makes nothing but money is a poor business" Ford remember us the function and purpose of business. One man's job is another man's business in most of the cases. If somebody making money by conducting an illegal business, it is absolutely harmful to the society. Every individual worker or an employer give some service to the rest of the world. It is same even it is a bank employ or a college professor. People most often forget that what they are actually doing is they work for others. They just think like they work for themselves. If I tell you the word ''work ethics'' you would possibly understand this. Allegiant military man is someone who is ready to die for his country. This is same in the case of business too. 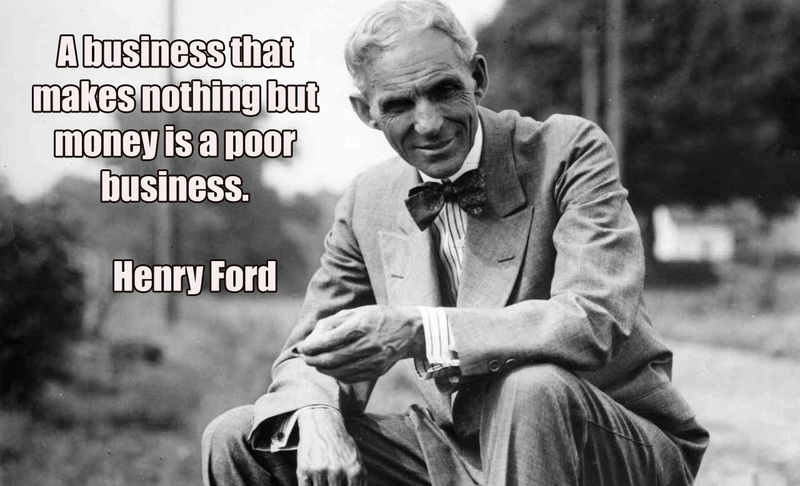 Henry ford inspires young entrepreneurs how to choose a commercial or industrial enterprise. Nowadays it is a common practice of industries is to try to evade tax through illegal and fake techniques. The Sad part is people are even willing to start something which even negatively influences the society. The measure of the greatness of a company is not the annual revenue which makes every year but the amount of commitment to the technical and economic growth of the nation and world. We can confidently say that a business is poor if it has no moral values.